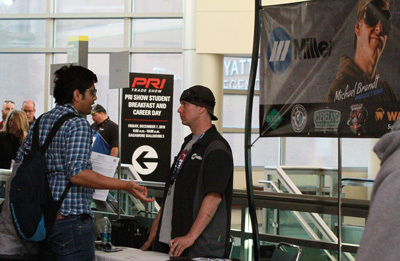 SEMA Education offers different programs for students at events, including the PRI Trade Show. Someone once said, “Learning is not a spectator sport.” That certainly applies to the interactive, student-centric learning experiences that take place during the annual SEMA Show and Performance Racing Industry (PRI) Trade Show. Through an assortment of initiatives, SEMA’s student programs are aimed at inspiring and encouraging young people to engage in and learn about the aftermarket industry. SEMA’s student programs cover a range of activities and reach a wide base of schools, students and school officials. Here’s a snapshot of some of the key SEMA student programs held during the association-sponsored trade shows. The SEMA Show Student Program has been in place for quite some time. More than 1,700 students and 650-plus administrators and faculty representing 300 schools attended the SEMA Show last year. The various events and activities afforded numerous opportunities to network, learn about the SEMA Scholarship Program and explore career paths. Students gather to check out different career opportunities during SEMA Show Career Day. On Monday, October 29, students and faculty were treated to lunch at the Westgate Theater while witnessing the premier business competition that helps to launch innovative products and services. Now in its sixth year, Launch Pad, powered by the Young Executives Network, offers young innovators, inventors and entrepreneurs a singular opportunity to showcase their new automotive products or services. Ten finalists were on hand to pitch their concepts as they vied for a chance to take their products to the next level through access to business resources, brand awareness, face time with key industry influencers, and an award of $10,000 to be used to benefit the winner’s business. Matt Beenen, owner of BuiltRight Industries, took top honors for his cargo-storage Bedside Rack System. Student Career Day is aimed at exposing students to the diversity of career paths in the aftermarket industry. And what better way than to have students intermingle directly with company representatives from various aftermarket segments. During the afternoon program on Monday, more than 1,300 students and school officials interacted with 51 leading companies that had signed up for the program. As manufacturers and others shared their knowledge and insights, students were able to gain firsthand knowledge of career opportunities, learn about skills needed for specific types of jobs, and form invaluable connections with industry professionals. Successful Student Keynote Lunch gave students the opportunity to grow their network. Started in 2011 as part of the SEMA Show Student Program, the Gear-Up Girl networking event, hosted by the SEMA Businesswomen’s Network (SBN), connects female students with industry-leading professional women. The popular, women-only event was attended by a standing-room-only crowd who spent time chatting with old friends and bonding with new acquaintances. Gear-Up Girl is also where SBN salutes distinguished women in the industry. The Athena Rising Star Award recognizes a woman under 30 who is making significant strides in advancing her career. The Athena Woman of the Year Award is presented in recognition of a woman’s leadership, knowledge and management abilities, while the Athena Champion Award honors a woman’s lifetime contributions and dedication to supporting women in the industry. Once a year, the SEMA Memorial Scholarship Fund awards scholarships to worthy students pursuing careers in the automotive industry. The recipients are invited to attend the winner-recognition luncheon at the SEMA Show. Students and school officials participating in SEMA’s student program are invited as well, giving them a chance to learn about the scholarship program. Highlights for 2018 included welcoming remarks from SEMA Board Chair Wade Kawasaki and a winner-recognition ceremony hosted by Kim Pendergast, CEO of Magnuson and chair of the scholarship committee. Also on tap were a photo opportunity with Tim Martin, SEMA chairman-elect and SEMA Foundation chair, and an interactive presentation by Patti Wood of Communications Dynamics on the topic of how to navigate nonverbal and body-language differences between men and women in the workplace. Student interviews during PRI Trade Show in Indianapolis. The PRI Show Student Program took place on December 7 during the 2018 PRI Trade Show in Indianapolis. Eighty-one schools were represented in the program; more than 600 students and 70-plus school faculty and administrators were in attendance. For top students and school officials from across the country, the annual PRI Student Breakfast presented a unique opportunity to meet and connect with racing and performance industry leaders. The event kicked off with a breakfast featuring an industry “career path” panel discussion and interactive student interviews. Panelists included Jamie Eriksen, SEMA special events director; Michael Brandt, owner/welder/fabricator at Garage Bound LLC; and Chris Douglas, COO of Comp Performance Group. Three students were invited to participate in live on-stage mock interviews and received thank-you gifts for their participation. Immediately following the breakfast, students visited with representatives from 29 companies and educational organizations at the second annual PRI Show Student Career Day. Much like the SEMA Show Career Day program, the PRI event gave students valuable face time with established industry professionals and a chance to learn about the vast array of career opportunities in the performance racing industry. “The vision is to leverage trade shows to enlighten students about careers in automotive,” said Juliet Marshall, SEMA manager of student programs. Marshall also noted that the success of the student programs is due in significant measure to support from the SEMA Board, which has identified career paths and youth engagement as a core initiative. “It’s especially important to recognize that the program continues to be possible because of the vision, the support and the direction of the SEMA Board of Directors,” Marshall said.